A Ballboy/Ballgirl schedule is being put together for this season's games. Four kids are needed for each game. Please contact Coach Tackett or Alan Binger at redwings@nwonline.net if you are interested in helping this season or know of someone for Alan to contact. Children should be from grades 3-8. Younger siblings of varsity players would be great! 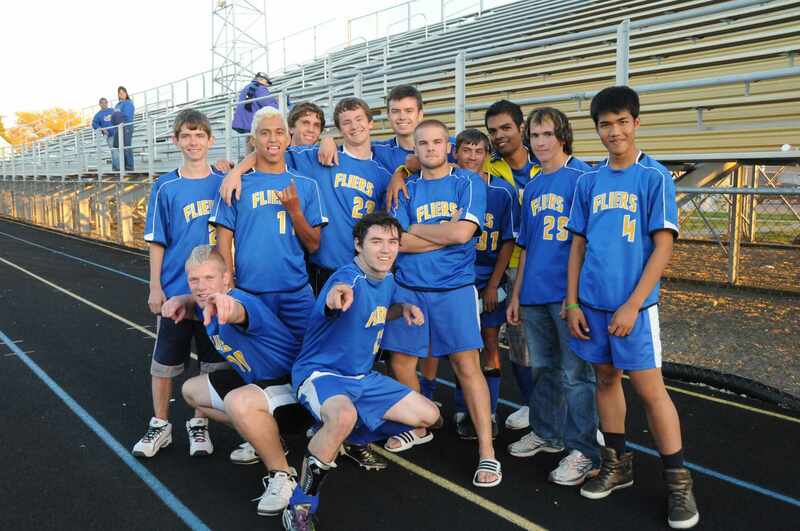 The Flier Soccer program records are now updated for 2009. Click on "Varsity Soccer Records" to view the Excel file with the records. Hard copies will be available at the soccer banquet. 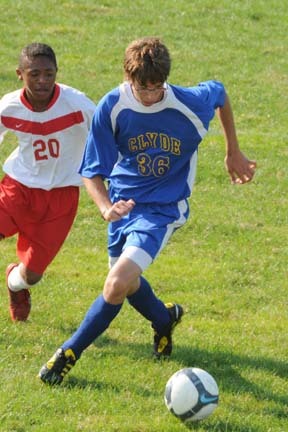 The 2010 Clyde Flier soccer season is ready to roll with a pair of scrimmages this week. The Fliers travel to Frost-Kalnow stadium in Tiffin to tangle with the Tornadoes on Tuesday afternoon and then host the Stockaders of Old Fort on Thursday at Clyde High School. Both scrimmages kick off at 5:00 p.m.
Tiffin, Ohio - The Fliers got the 2010 season underway at Frost-Kalnow stadium in Tiffin falling to the Columbian Tornadoes 3-1 in scrimmage action. Taylor Aldrich scored a header for the Fliers in the 79th minute off a Garrett Binger corner kick. Teage Pinion was in goal for the Fliers and stopped 7 of 10 Tornado shots on goal. One of the three goals allowed was on a penalty kick. Aldrich also contributed 3 steals, 4 clears and 3 intercepted passes for the Fliers. Playing in the sweeper position, Mike Harden recorded 4 clears, 3 interceptions and a steal. Garrett Strait added 5 clears, a steal and an interception. 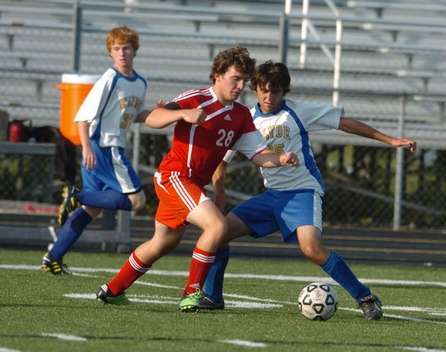 Andrew Collins, playing in the midfield, had 2 steals, 2 interceptions and added a shot on goal. Binger had 2 shots on goal for Clyde. The game gave Coach Tackett a chance to see a lot of new players in game action. There were impressive performances made be many of them. The Fliers are back in action on Thursday night for a scrimmage with the Old Fort Stockaders. Clyde, Ohio - Coach Tackett pointed out improvements in the play of the inexperienced Fliers after a 3-1 loss to the Old Fort Stockaders in scrimmage action on Thursday night. After a scoreless first half, Old Fort scored their first goal about 10 minutes into the second half on Austin Heishman who was seeing his first varsity action in goal for the Fliers. They would get another goal about 15 minutes later to take a 2-0 lead. Garrett Binger brought the Fliers to within one after Mike Harden hit him with a long pass from his sweeper role. The Stockaders got an insurance goal with about 5 minutes left in the contest. Harden recorded 11 clears, 2 interceptions and a steal in the game while Andrew Collins added 3 steals, 3 clears and 3 interceptions from his midfield position. Garrett Strait picked up 4 interceptions, 3 clears and a steal with Taylor Aldrich adding a steal and 3 interceptions. Sam Gerber made 3 clears, 2 interceptions and a steal. Teage Pinion played in net for the first half and stopped all 3 shots he faced. Heishman recorded 6 saves on 9 second half Old Fort shots. The Stockaders held a 12-6 advantage on shots on goal. The Fliers open the season next Thursday afternoon at Upper Sandusky. The soccer field is behind the high school. Upper Sandusky, Ohio - With youth soccer teams practicing on adjacent fields, the Upper Sandusky Rams varsity squad raced to a 6-0 halftime lead and coasted to a 7-2 victory over the inexperienced Fliers in the season opener for both teams. The significance of seeing the youngsters playing nearby was characteristic of the stages of development of the soccer programs at the two schools. Teage Pinion started in net for the Fliers and recorded 11 saves on 17 Rams shots. Pinion was agressive in net with a number of the saves coming from point blank range. In the second half Upper Sandusky subbed liberally and the Fliers performed much better against the younger Rams. Clyde actually outshot the Rams 7-5 in the second half outscoring the home team 2-1. Austin Heishman played nearly all of the second half in net and stopped 4 of 5 shots. Taylor Aldrich got the Fliers on the scoreboard just 4 minutes into the second half with Sahen Fultz. With 7 minutes left in the contest Garrett Binger assisted on a goal by Collins. Coach Tackett was pleased with the play in the second half which showed that the athletes are progressing and are able to carry out some of the game strategies they are practicing when they are playing an opponent that is closer to our team's skill level. To go along with his goal, Aldrich recorded 6 intercepted passes, 2 steals and a clear. Collins, who had 4 shots on goal for the game, added 4 interceptions and 2 steals. Sammy Gerber made 3 clears and 3 interceptions. Mike Harden had 2 clears, a steal and a blocked shot. The Fliers are back in action on Saturday morning as they host Toledo Start at 11:00. Clyde, Ohio - The Toledo Start Spartans were guests for the home opener for the 2010 Flier soccer season. They scored two early goals on the Fliers and added two more late in the half to take a 4-0 lead into the break. Oliver Toernkvist made it a 4-1 game after he took a pass from David Norman six minutes into the second half and found the back of the net. Just two minutes later the lead was back to 4 goals when the Spartans got a quick one to stop Clyde's momentum. The score remained 5-1 until Start got a late goal on relief goalie, Austin Heishman with just 5 minutes left in the contest. Heishman made 4 saves in his action while starter, Teage Pinion recorded 5 saves in 10 shots. Defensively, Sam Gerber led the way with 3 clears and 4 interceptions. Huron, Ohio - The SBC opener faced the Fliers against one of the SBC's best teams. The inexperience of the Fliers showed as Huron controlled much of the action taking a 6-0 lead into halftime. They added 4 more in the second half to run away with a 10-0 victory. Teage Pinion recorded 6 saves on 10 shots in goal with Austin Heishman adding 5 saves on 11 Tiger shots. Mike Harden made 4 steals, 5 clears and 3 interceptions from his sweeper role. Andrew Collins added 4 steals, a clear and 3 interceptions. Taylor Aldrich had a blocked shot, 4 clears and 3 interceptions. Garrett Strait also blocked a shot. The Fliers step out of conference play on Saturday morning for a game at South Amherst Middle School against Firelands High School. 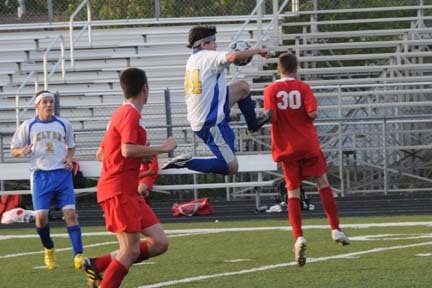 South Amherst, Ohio - The Fliers showed some improvement despite being shut out in a 2-0 loss against Firelands High School at South Amherst Middle School. With a strong wind at their backs, the Fliers had a number of scoring chances during the first half but it was Firelands who scored on their only shot of the first half to take the 1-0 lead at the break. In the second half Clyde was playing into the wind and had a difficult time moving the ball into the Falcons half of the field. Teage Pinion kept the game close, however, stopping 8 of the 9 shots he faced in the second half. Dristen Goon went out of the game midway through the first half with a collarbone injury. Play was temporarily suspended while the local rescue squad was required to take him to the hospital. We all hope Dristen recovers quickly. He will most likely be out for the remainder of the season. Elmore, Ohio - The Fliers ran into a buzzsaw when they played the Woodmore Wildcats on Tuesday night in Elmore. The Wildcats put up 8 first half goals into a strong wind and cruised to a 12-0 shutout. Teage Pinion recorded 9 saves on 17 first half shots with Austin Heishman adding 8 saves on 12 second half shots. Garrett Strait had 4 clears and 4 interceptions while Sam Gerber added 3 of each in their defensive roles. Mike Harden had 4 clears, 2 steals and an interception. Andrew Collins had 2 steals, 2 interceptions and a clear. Garrett Binger recorded 2 shots on goal and also missed the net on 4 shots. The Fliers are back in SBC action on Thursday night at Perkins. Perkins Twp, Ohio - For the fourth straight game, the Fliers have failed to find the back of the opposition's net. This time the league leading Pirates handed Clyde a 5-0 setback. At times the play of the Fliers was much improved over the Tuesday night game. Clyde trailed just 2-0 at the break. Three goals, the last of which was a penalty shot, midway through the second half sealed the deal for the Pirates. Mike Harden lead in the stats column with 11 clears, 4 steals and 3 intercepted passes. Sam Gerber added 6 clears a blocked shot and an interception. Andrew Collins recorded 4 steals and 2 interceptions with Sahen Fultz adding 5 steals and an interception. Teage Pinion also picked up some impressive stats adding 3 interceptions, 2 clears and a steal while Garrett Strait blocked a shot and recorded a steal, a clear and an interception. 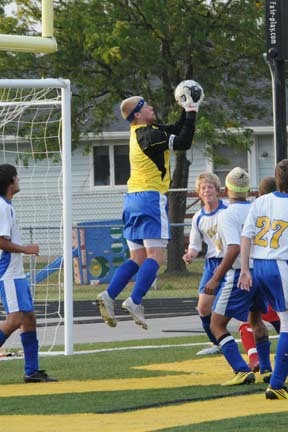 Austin Heishman played in goal for the Fliers and stopped 5 of 10 shots including the penalty kick goal by Perkins. The Fliers are back in non-conference action on Saturday morning as they tangle with the Sandusky Blue Streaks at Venice Heights Elementary School at noon. Venice Heights, Ohio - After a scoreless first half, the Sandusky Blue Streaks put up four goals in the second half before the Fliers finally got on the scoreboard in the 72nd minute of the game. The Fliers lost 4-1 in a game where they outshot the Blue Streaks 8-6 in the first half but could only manage 3 shots on goal against the second half wind. Taylor Aldrich scored the goal for the Fliers on one of two shots he had in the contest. Garrett Binger managed 3 shots on goal but couldn't find the back of the net. Austin Heishman stopped all 6 first half Sandusky shots, but could only stop 2 of the 6 shots he faced in the second half. Andrew Collins had 3 steals and 5 intercepted passes for change of possession and added a shot on goal. Garrett Strat recorded 4 clears, a steal and 3 interceptions. Samy Gerber added 3 clears, a steal and a blocked shot with Mike Harden getting 2 steals and 2 clears. Pabpibulsuk Rodrungruang had 2 steals and 2 interceptions. Thayne Koth had 2 interceptions and 2 shots on goal. Oak Harbor, Ohio - It's hard to find any positives from a 12-0 shutout as the Oak Harbor Rockets used the game with the Fliers to pad their stats a bit, running up the score in the second of Tuesday's game. Austin Heishman was pummeled in net facing 15 shots in the first half, giving up 5 goals. Austin and first time goalie, Taylor Aldrich combined to stop 8 of 15 second half shots. Sam Gerber made 7 clears, 3 steals, blocked 3 shots and recorded 2 interceptions. Andrew Collins had 6 interceptions, a blocked shot, 3 steals and a clear. Mike Harden recorded a clear, 5 interceptions and also blocked a shot. Luke Boyle, coming in off the bench also blocked 2 shots for the Fliers. The Fliers were rained out at Edison on Thursday and the game will be made up on Monday night, September 20 at Edison High School. Milan, Ohio - The Fliers could muster no offensive threat in a 6-0 shutout at the hands of the Edison Chargers on Monday night. Austin Heishman started in goal for the Fliers and stopped 5 of 7 first half shots but allowed 4 goals on the first 7 shots of the second half including a penalty kick goal. Teage Pinion played the final 20 minutes in net and stopped 6 of 7 shots. Sam Gerber recorded 5 clears a steal and 2 interceptions with Mike Harden blocking a shot, adding 4 steals and a clear. Garrett Strait picked up 5 clears and an interception while Andrew Collins added 3 interceptions and 2 clears. The Fliers are right back in action hosting undefeated Port Clinton on Tuesday night at Bishop Stadium. Clyde, Ohio - "The scoreboard did not indicate how well you played tonight" was the message of Coach Tackett to his team after a 5-0 loss to SBC leading Port Clinton on Tuesday night at Bishop Stadium. While he told them they still need to improve on communication, he complimented them on "much better opportunities on goal". Mike Harden recorded a blocked shot, 3 clears, 2 interceptions and a steal, while Andrew Collins recorded 4 clears, 4 interceptions and a steal. Sam Gerber added 6 clears, 2 intercepted passes and a steal with Garrett Strait getting 4 clears, a steal and a blocked shot. Six players recorded a shot on goal, a much better offensive output than the previous night. Austin Heishman stopped 7 of 10 first half shots and added another 5 saves on 7 second half shots. Garrett's Shot is Stopped but Taylor is there to Clean Up the Trash! Clyde, Ohio - The Fliers finally found a little offense in a 10-2 loss to the Huron Tigers on Thursday night. Taylor Aldrich scored his 3rd and 4th goals of the season. His first half goal found him crashing the goal and stuffing in the rebound of a shot by Garrett Binger which had been deflected by the Huron keeper. He scored again in the second half off an assist from Miguel Villasenor. Coach Tackett was pleased with the progress his team is making but said the team still needs to learn to finish scoring opportunities. "They close the door on scoring opportunities....we need to do that" he commented. He said there was some good ball movement which was a carryover of improvement shown in Tuesday's game against Port Clinton. Andrew Collins and Garrett Strait led the defensive stats with Collins recording 6 interceptions and 2 steals while Strait added 2 clears to his 6 intercepted passes. Sahen Fultz played tough getting 2 steals, 3 interceptions and a clear. Austin Heishman and Teage Pinion shared keeper duties with each surrendering 5 goals. The Fliers take a break from SBC action next week when they face the Fremont St. Joseph Streaks at Bishop Stadium with a rare Wednesday afternoon game. The Streaks are also struggling this season so it promises to be a good game. Taylor Proves White Boys Can Jump! Clyde, Ohio - After a one year blip last season when the Fremont St. Joseph Central Catholic Streaks dropped the Fliers by a 7-2 count, it was back to normal as the Streaks and Fliers tied for the 4th time in the past 5 years. This time it was a 1-1 score. It looked like the Fliers would finally get one in the "Win" column until Paul Wendt knotted the score for the Streaks with just 4 minutes left in the contest. Taylor Aldrich had put the Fliers up 1-0 early in the second half for Clyde's first lead in any game this season. The lead held up for over 30 minutes but the talented Wendt finally put one in the back of the net...the only goal allowed by Fliers Senior Keeper, Teage Pinion who faced 10 shots in the contest. Mike Harden got an assist on Aldrich's goal for his first point of the season. Sam Gerber had 11 clears, 2 steals and a blocked shot in the game with Andrew Collins playing a solid game in the middle of the field with 6 intercepted passes, 2 clears and 2 steals. Garrett Binger put 3 shots on net. It was fun to have a very competitive and evenly played game! Great job Fliers. Clyde, Ohio - The Perkins Pirates came to Bob Bishop Stadium Tuesday afternoon and extended their September 9th shutout of the Fliers, this time by a 6-0 score. The first 12 minutes of the game were fairly even, but 3 goals in the last 8 minutes of the first half gave the Pirates a 5-0 halftime lead. The Fliers played much better in the second half when Perkins did a significant amount of subbing, but they could still not find the back of the Pirate net. Teage Pinion played in goal for the first half and recorded 9 saves on 14 shots. Sam Gerber saw is first action in goal in the second half a stopped 7 of 8 Perkins shots. The Fliers are back in action Wednesday night against the league leading Oak Harbor Rockets. The game will also be played at Clyde High School. Clyde, Ohio - The Fliers lost 6-0 for the second consecutive night as this time the Oak Harbor Rockets shut the Fliers down. Teage Pinion's 19 save performance ranks 3rd All-Time for the program. Andrew Collins lead the team statistically with 5 intercepted passes, 4 steals and 3 clears. Garrett Strait recorded 4 clears and a interception with Cleveland Brown adding 5 clears. The Fliers head into the final week of regular season play still searching for their first win of the season, but still showing improvement. Clyde, Ohio - The Fliers Senior Class played their final home game of the season and lost a 4-0 game to the Edison Chargers. Once again, the Fliers improved over the 6-0 loss at Edison earlier in the season....a game in which the Chargers' leading scorer did not play. Teage Pinion stopped 5 of 9 Edison shots playing 74 minutes of the contest before Sam Gerber relieved him in net for the Fliers. Gerber stopped the only shot he faced in the final minutes. Andrew Collins recorded 8 intercepted passes in the game to go along with a clear and a steal. Taylor Aldrich had a blocked shot, 2 interceptions and a steal while Cleveland Brown added 2 blocked shots and an interception. The Fliers complete the regular season on Thursday at Port Clinton. Port Clinton, Ohio - The Fliers ended the regular season without a win after a 9-1 loss to the Port Clinton Redskins. Oliver Toernkvist scored in the last minute to spoil the shutout for the Redskins. Andrew Collins had 5 interceptions for the Fliers along with a steal and a clear. Cleveland Brown blocked a shot, had 5 clears and a steal. David Norman added a blocked shot for the Fliers. Teage Pinion stopped 8 of 14 shots in goal with Sammy Gerber recording 2 saves on 5 Redskin shots after relieving Teage midway through the second half. The Fliers face SBC Champs, Oak Harbor, at Lake High School on Saturday afternoon in the sectional tournament. Millbury, Ohio - The Fliers fell to the Oak Harbor Rockets for the third time this season in the OHSAA state sectional tournament at Lake High School. Trailing 9-0, Taylor Aldrich scored with 8 minutes left to spoil the shutout. Oliver Toernkvist assisted on the goal. Along with the goal, Aldrich had 5 intercepted passes, 2 clears and a steal. Andrew Collins added 4 clears, 2 interceptions and a steal. Teage Pinion and Sammy Gerber split time in goal. Teage allowed 5 goals on 15 first half shots with Sam allowing 4 goals on 12 shots in the second half. Despite the lopsided play, the Fliers kept playing hard throughout and finished the game with an all-senior lineup. Great work Fliers! Five Fliers were given Honorable Mention status as the All Sandusky Bay Conference team was announced on Monday. Congratulations to Andrew Collins, Sam Gerber, Sahen Fultz, Taylor Aldrich and Garrett Binger. Phil Wierich of Oak Harbor was named the top player in the league for the second straight year. Congratulations to these fine young men!